Mr A is originally from Birmingham and on a trip up there earlier this year, we noticed a new store front that said Vegan Store on it. I got totally over-excited and googled it and it turns out it was a soon-to-opening, um vegan store. Name says it all really! I still haven't had a chance to go myself yet, but Mr A found out his friend from Brum was coming down this way at the weekend and he sneakily asked him to seek out some stuff as a surprise for me. Mainly Round-up, as I've been dreaming of those for weeks. Well he outdid himself.... look! 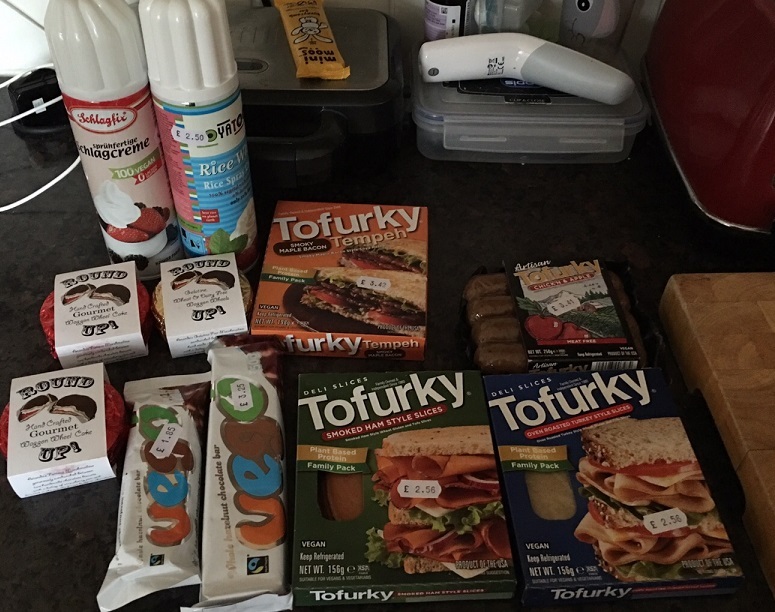 I got 4 different Tofurky products that Holland & Barrett don't stock. Round-ups, Vego bars, Schlagfix squirty cream (my fave) and rice whip! 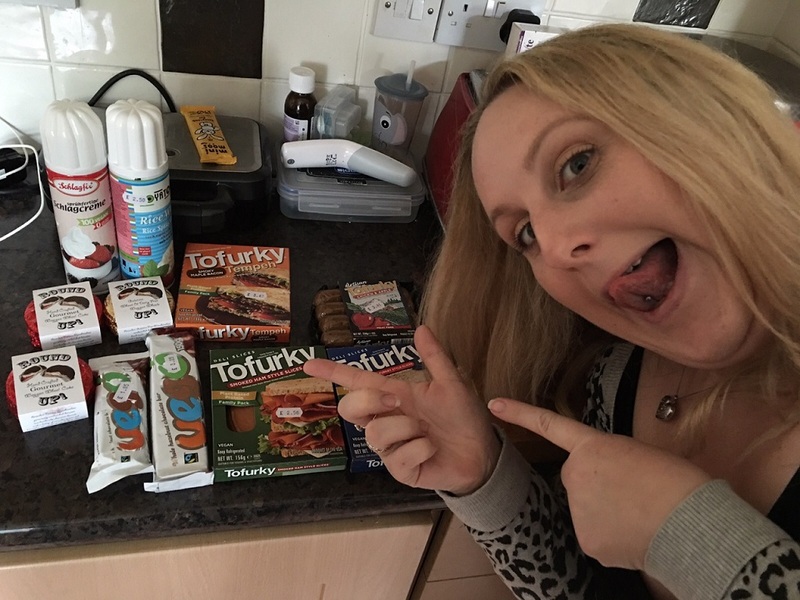 One of the Tofurky products I got was their hicory smoked maple bacon tempeh slices. I couldn't wait to try these and as we'd already decided on Brinner for Saturday night's eats, it was perfect timing. (It's really good by the way). Also, I finally got to try the gold Round-ups, I usually just buy the red ones. The gold ones are wheat free (not sure about gluten) and they are definitely not as good as the red ones. The biscuit is a bit drier and the marshamllowy middle isn't as, well marshmallowy! They are still good though, so if you can't eat wheat, give these a try! Next time we go up, I'll hopefully make it to the store myself. Vegan Store's Website / Facebook. I love that tempeh bacon and I'm excited that the UK's getting a new vegan store! That's rad! yay!! What are those rings? They look like spaghettios. 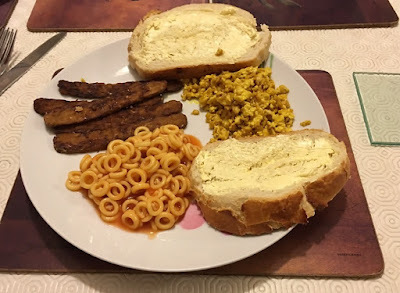 Does the UK have a vegan version? I've been missing spaghettios for sooo long. Yep they are heinz spaghetti hoops which I think are probably the same/similar. Ooh I didn't know CoYo did ice cream, so that's exciting!